https://www.youtube.com/watch?v=qjUb6Nn8liA Full learning guide (includes Fusion 360 source, Product Links, Software setup, etc.) 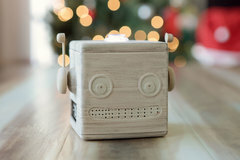 https://learn.adafruit.com/3d-printed-google-aiy-voice-kit/overview Upgrade from the included cardboard box to a fully mountable, customizable enclosure! Our design features snap fit lids with standoffs to securely attach all of the comments required to to build your own Google Assistant Voice project! Our enclosure fits Raspberry Pi boards with the voice hat, opening for all of the ports, as well as mounts for the microphone and arcade button. The design is completely open and allows you add include more parts for any type of AI project!